Editing is the last and, probably, the most important step in term paper writing. Without elaborative term paper editing, you may not achieve the results expected which means your grade may be much reduced. That is why we strongly recommend you not neglect this stage. Term paper editing is better to do some time after the entire paper is completed. The fresh mind will help you find more shortcomings and mistakes in your paper. First, read your paper aloud and tape-record it. Listen to what you have read and try to find the sentences that need being corrected. If it seems that your topic is not covered fully, do not hesitate to change your paper. Spend as much time as needed to do it properly, as your grade depends much on this factor. Make sure you did not miss anything when presenting information about your class, your supervisor, date of submission, etc. Pay attention to the margins. Are they done in correspondence with the rules of the style required (either APA or MLA)? Make sure the page numbers are set in the appropriate corners of the pages. Mostly, page numbers are set beginning with the introductory part, still, in some cases pagination should start with the title page. Most teachers require abbreviation to be placed on a separate page. Each abbreviation should also be explained in words. Make sure that each of the page numbers in your contents is placed in front of the required item. Check whether your foot/endnotes are formatted correctly and the appropriate information is presented in brackets. Misprints will hardly influence your grade much only if there are few of them. However, if your paper is full of misprints and a lot of words are missed, your teacher may get angry and reduce your grade. Use dictionaries to check your grammar and spelling and find out how to correct this type of mistakes. Make sure all figures are labeled. If some of them are taken from other sources, make sure you have presented these sources in your paper. 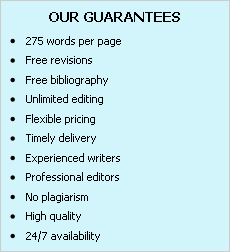 If you lack time for term paper editing, do not hesitate to use our services. Professional writers will edit your paper for you.